Today, I'm looking at the legendary partnership between director Josef von Sternberg and star Marlene Dietrich. The photo above is from the period when the pair collaborated on The Blue Angel (1930). This article is part of Classic Symbiotic Collaborations: The Star-Director Blogathon hosted by CineMaven's Essays from the Couch. There never has been a cinematic collaboration quite like that between director Josef von Sternberg and star Marlene Dietrich. Together they transformed a rather ordinary girl from the Berlin suburbs into an international superstar whose untouchable glamour appealed to both men and women. Von Sternberg and Dietrich made seven films together in the early 1930's, and, while all these movies are interesting, today I'm going to look at the pair's legendary collaboration through the prism of The Scarlet Empress, a 1934 biopic of Catherine the Great that is von Sternberg and Dietrich's penultimate film together. This movie is not only my personal favorite among their collaborations, but it is also features themes that appeared over and over in the pair's films. The Scarlet Empress is a triumph of style -- von Sternberg's signature cinematography always showcased Dietrich at her most beautiful -- but it also has a substantial message about one woman's struggle for power in a man's world. But before I delve into The Scarlet Empress, here's a little background. A French poster for The Scarlet Empress (1934). 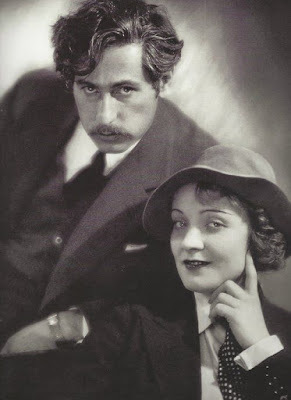 Von Sternberg was born in 1894 in Vienna to a poor Jewish family, whom later emigrated to the U.S. so von Sternberg's father could work in the garment district in New York City. As a teenager, von Sternberg got a job cleaning movie prints, and the talented young man soon worked his way up in the nascent film industry. Von Sternberg's films were very popular in the 1920's -- he virtually invented the crime drama in movies like Underworld (1927) -- but his popularity waned later in the decade so he headed to Germany to make The Blue Angel, the story of seductive cabaret singer, Lola-Lola (Dietrich), who ruins the life of bourgeois schoolteacher (Emil Jannings). Dietrich, who grew up in the Berlin suburbs as the daughter of a police lieutenant and his wealthy wife, was a rising star in German cinema when von Sternberg cast her as Lola-Lola. Dietrich's performance, especially her singing "Falling in Love Again (Can't Help It)" while dressed in a man's hat and lingerie, made her an international sensation. The success of The Blue Angel landed Dietrich a contract with Paramount Pictures, where she and von Sternberg immediately made Morocco (1930), a semi-remake of The Blue Angel that co-starred Gary Cooper as a French legionnaire. The pair next teamed up for the wildly successful spy movie Dishonored (1931) and the train thriller Shanghai Express (1932) before stumbling at the box office with Blonde Venus (when I tell you that this movie is a romance between an international nightclub singer and an American chemist (Herbert Marshall) who is dying of radium poisoning you'll understand why ticket sales weren't so brisk). Marlene Dietrich and John Lodge in a vintage lobby card for The Scarlet Empress (1934). Dietrich and von Sternberg then decided to tackle the flamboyant life of Russian Empress Catherine the Great. Historical dramas were in vogue thanks to Greta Garbo's iconic performance in Queen Christina (1933), and the talents of Dietrich and von Sternberg were perfectly suited to the glamour and intrigue in the Russian Imperial Court. The Scarlet Empress follows Catherine from her days as a German princess through her marriage to the bizarre Russian Grand Duke Peter (Sam Jaffe, in a performance of whispery menace) and finally to her takeover of the country while at the head of the Imperial Army. Today, many movie stars get their looks from the plastic surgeon's office, but Dietrich and von Sternberg created her signature style the old-fashioned way. In The Blue Angel, Dietrich had a striking screen presence, but she still looked rather ordinary. That all changed when she moved to Paramount Pictures where she was transformed by a team of make-up artists and lighting experts. 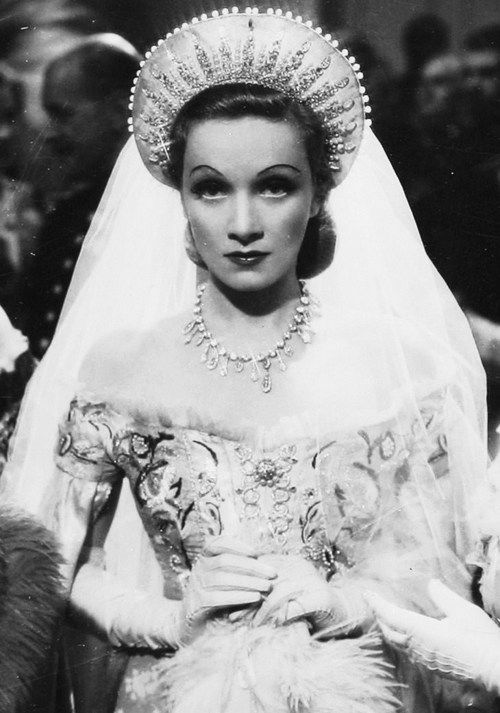 Dietrich became a creature of exotic glamour through bleached hair, plucked eyebrows and expertly applied cosmetics. Von Sternberg also began photographing her with great care using a technique called butterfly lighting to accentuate her striking facial features (the portrait above is a good example of this technique). 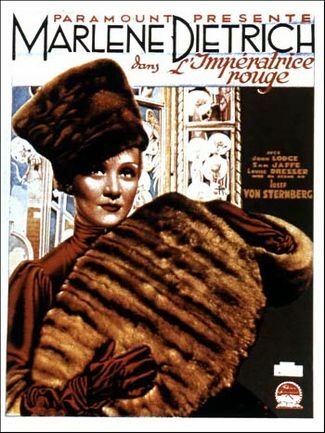 Menswear was a signature of Dietrich's screen style, but, in The Scarlet Empress, von Sternberg's uses her wardrobe to do more than titillate the audience or make a mere fashion statement. Dietrich's costumes help tell the story: She begins the movie as an innocent with frilly dresses and flowers in her hair, while she ends the movie as a seasoned woman of the world with a power wardrobe to match that includes this Travis Banton-designed Cossack uniform. Dietrich's screen persona is frequently described as that of the ultimate man-trap: a seductive temptress who destroys men's lives on a mere whim. While that's true up to a point, there is actually a lot more going on in the Dietrich-von Sternberg films. Dietrich is often a woman trapped in a man's world, who is trying to maintain her own identity while the men around her use her body and crush her spirit. This is especially evident in The Scarlet Empress, where Dietrich begins the film as an innocent young woman who has no control over her choice of husband. Gradually, she takes control, first of her own body -- when her husband is unwilling or unable to give her a child, she finds other ways of conceiving a male heir -- and then of her own identity. 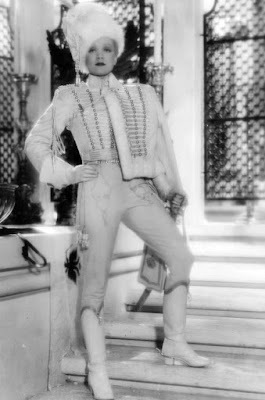 The final scene with Dietrich astride a white horse in a resplendent military uniform is a portrait of a woman in complete command of her own destiny. The Scarlet Empress was box-office bomb, and Dietrich and von Sternberg made only one more film together, The Devil Is a Woman (1935), before parting ways. 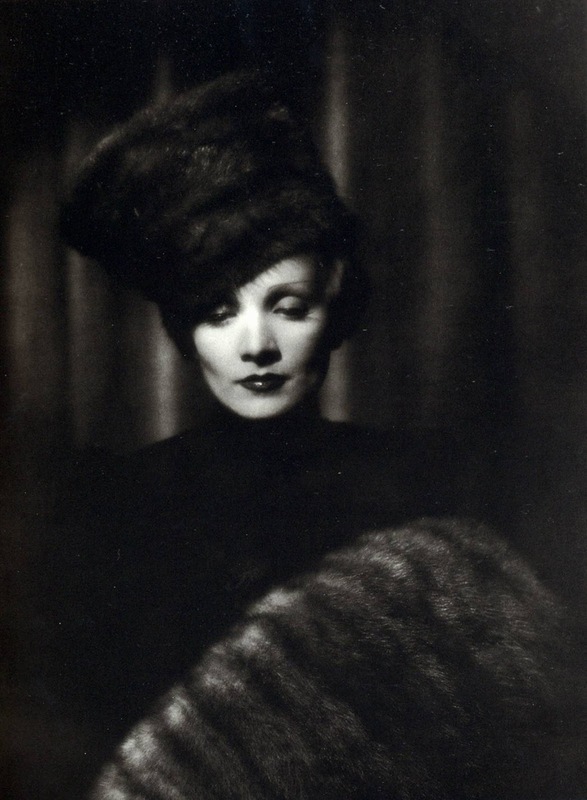 Nevertheless, Dietrich always maintained the persona she and von Sternberg created together. She spoofed her image in several films like Destry Rides Again (1939) and Stage Fright (1950), and her legendary concerts always featured her singing "Falling in Love Again (Can't Help It)" in a tuxedo and top hat. I'll leave you with a clip from The Scarlet Empress' wedding scene, which gives a good impression of von Sternberg's visual style and Dietrich's beauty. The Scarlet Empress is available on DVD from the Criterion Collection. Go here, for my articles from past blogathons. The more I see of this pair, the more I am fascinated by what they created. Next up will be the story of Catherine as you have made it impossible for me to ignore it. It is one of the most visually interesting films I've ever seen. It's a lot like Eisenstein, but even more over the top. 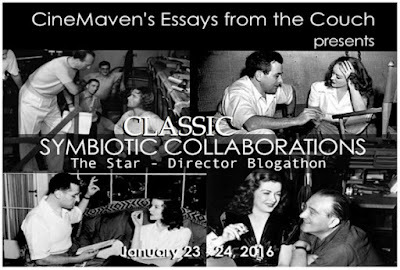 Thanks for sharing the three trademarks of the Dietrich-Von Sternberg collaborations. I hadn't really noticed these common elements, but I won't miss 'em now! Thanks. I really enjoyed writing it because it challenged me to look at their work from a new perspective. I've seen all the Dietrich/von Sternberg collaborations and have been absolutely blown away by them - must agree that the lighting is astonishing. I'm not sure which is my favourite, possibly 'The Blue Angel' or dare I say 'Blonde Venus' (I love both Herbert Marshall and Cary Grant, and it's interesting to see Dietrich playing a mother, plus I've also seen this one on the big screen, which always helps.) Great choice for the blogathon and you have made me want to revisit 'The Scarlet Empress'. I haven't seen Blonde Venus in quite awhile so I really need to re-watch it. I do remember the lullaby scene in the movie was very touching, and I think in real life Dietrich was a devoted mother and grandmother. What an extraordinary pair! Created a screen legend bigger than the screen itself. Great post, Amanda!